1981: Studies for project Perentie commenced in 1981. Tenders for a truck, utility, lightweight, MC2 with a payload of 0.7 to 1.0 tonne, and a truck, cargo, light, MC2 with a payload of 1.5 to 2.0 tonnes were called in June 1982. Seven companies submitted tenders and three were selected to provide test vehicles for trials. Jaguar Rover Australia (JRA) was selected to supply 2500 4×4's (1-tonne) and 400 6×6's (2-tonne). 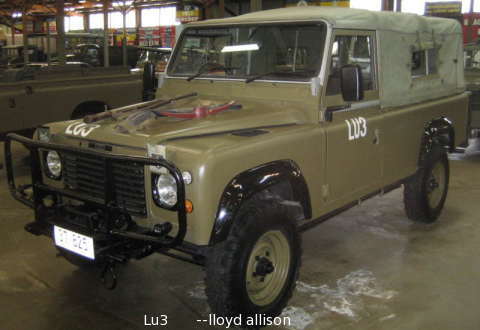 Land-Rover test vehicle, LU3, is restored and at the Army Museum, Bandiana (2007). The Perentie 4×4 and 6×6 are Australian-designed and built derivatives of the Land Rover 110. They come in a variety of body styles - soft-top, van, ambulance, long-range patrol vehicle and so on. Many vehicles are fitted with a PTO winch. Power comes from an Isuzu 3.9L 4-cyl diesel, which is turbo-charged on the 6×6. 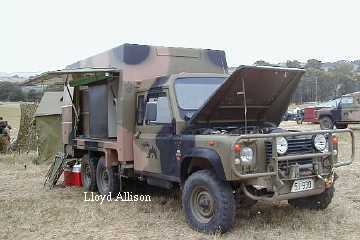 Isuzu diesels were factory fitted to many Australian Land Rover Stage-1s and 110s in the 1980s and early 1990s. The 4×4 chassis is somewhat lengthened so that the spare wheel can be mounted under the body at the rear. It also carries twin rear-mounted jerry cans and air-lift / tie-down eyes on the repositioned rear chassis cross-member. A bull-bar is fitted at the front without the traditional Land-Rover "RSJ" bumper bar. The chassis is galvanised. Power comes from an Isuzu 4-cylinder 3.9L diesel engine, as factory fitted to many Australian civilian Land Rovers during the 1980s. Transmission is the 4-speed LT95A - as fitted to early Range Rovers, the Forward Control 101, the series-3 stage-1, and early 110's although in this case it is uprated with taper roller-bearings on the transfer-case intermediate shaft, hence the A suffix. The bonnet (hood) carries brackets for a shovel, a pick and an axe. Some vehicles are fitted with a Thomas PTO winch with over-load protection. 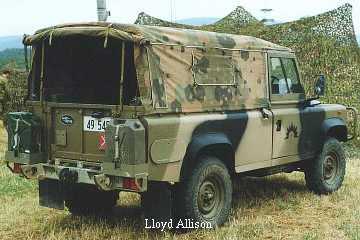 Several versions of the Perentie were supplied - soft-tops, hard-tops and station wagons. The hard-tops and station wagons have the tropical (double skinned) roof but do not have the alpine-light windows of civilian station wagons. The station wagons have the fuel filler positioned immediately behind the 2nd row of doors on the RHS so as to be close to the fuel tank which is between the front and rear wheels, the rear position being taken by the spare wheel as already noted. The various fitted for radio (FFR) vehicles carry an auxiliary 28-volt electrical system and four (two in the SWs) aerial mounts on the rear waistline. The soft-top FFR model has a fixed half-height tailgate instead of the usual hinged one. This model is strengthened, has a payload of 1200kg (v. 1000kg), taller hoops and tilt, side-rails on the bull-bar, and has a greater loa due to the rear-mounted jerry cans being oriented length-ways rather than side-ways. The six wheel drive Perentie is a unique Australian design, loosely based on the Land Rover 110 (later Land Rover Defender 110). It shares the 4-speed LT95A transmission and Isuzu 4BD1 3.9L 4-cylinder diesel engine with the four wheel drive Land Rover Perentie, but in this case the engine is turbo-charged. In view of the extra mass, 4.7:1 differentials are fitted instead of the 3.54:1 units of the 4×4. Front suspension is by live axle and coil-springs. The rear bogie employs two leaf springs and a load-sharing rocker on each side. This rocker is cranked, and the leaf springs on each side overlap, so that the springs can be longer and the rear axles can be closer together than would otherwise be possible. The chassis is unique to the six wheel drive. The rear section is fabricated of square and rectangular section steel tube and the chassis is galvanised. Drive to the third axle is by a separate propeller shaft taking power from the transfer-case power take-off (PTO). This PTO takes drive from a gear on the transfer case intermediate shaft and rotates at the same speed as the front (1st) and rear (2nd) prop'-shafts regardless of whether hi-range or lo-range is selected. The 3rd prop'-shaft passes over the second axle and is jointed, incorporating a c.v. joint, where it does so. In this way extreme articulation of the two rear axles is possible. This feature of the transmission was originally intended for use with a powered trailer on the Land Rover Forward Control 101. 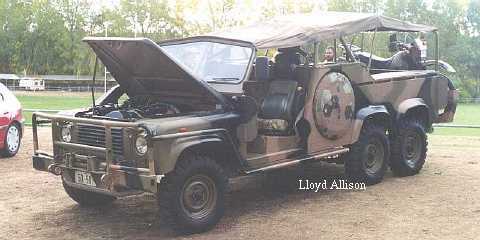 Prototypes and early models, some of which escaped into civilian hands, used a normal Land Rover 110 cab and front axle with the standard track of 1500mm against the rear's 1700mm. Production models use a wider, taller cab, and a 1700mm front track which matches the rear. Truck, air defence, light, FFR, winch, MC2 (cab + canopy), carries Rapier or RBS-70 anti-aircraft missiles and trailer. Truck, long range patrol, light, FFR, winch, MC2. This mean looking machine is open and without doors. It carries spare wheels recessed into each side of the bodywork, a machine-gun, and a rear-mounted 250cc motorcycle. 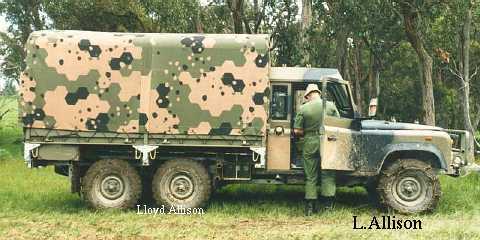 2001-2003: LandRovers, including 6×6s, served with Australian forces in Afghanistan (2001, 2002, ...), and Iraq (2003-2008). 2008 October: The ADF decided that the replacement for its Land Rover fleet, as part of Land 121 Project Overlander, would be the G-wagen.